Home › Articles › Church’s Lunar Communion Is Out of This World! Church’s Lunar Communion Is Out of This World! John Glenn, Jerry Carr, Charlie Bassett, and Roger Chaffee were active members of the church, located on NASA Parkway, not far from NASA’s Manned Spacecraft Center. 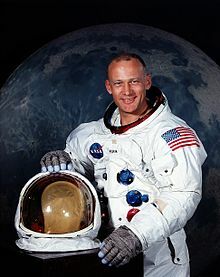 You can read all about Aldrin and other Christians in the space program in “Bless Thou the Astronauts,” published by Christianity Today’s “The Behemoth” online magazine. 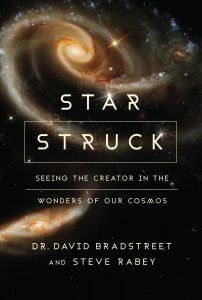 The article is an excerpt from Star Struck, my new book with astronomer David Bradstreet. The public remained in the dark about Aldrin’s brief lunar liturgy. That’s partly because atheist activist Madalyn Murray O’Hair had earlier sued the U.S. government following an earlier demonstration of astronauts’ faith. Back in December 1968, Frank Borman, James Lovell, and William Anders became the first humans to orbit the Moon. The Apollo 8 astronauts celebrated by delivering a simple Christmas Eve message for everyone back home, taking turns reading the first ten verses of Genesis 1 from the King James Bible. After hearing taxpayer-supported astronauts reciting the Bible from space, O’Hair claimed they had violated the First Amendment. The case was dismissed, but from now on, Christian astronauts would find quieter ways to express their faith. 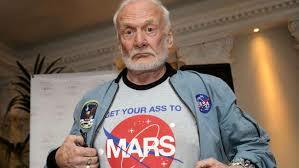 Buzz Aldrin’s lunar communion was kept quiet, but he has often spoken and written about it over the years. “It was interesting to think that the very first liquid ever poured on the moon, and the first food eaten there, were communion elements,” he said. Lunar Communion Sunday is just one of the ways Webster Presbyterian Church’s seeks to honor God and serve members of the scientific community. Its sanctuary is beautifully decorated with astronomical improvisations on the standard church furnishings. Stained glass windows portray nebulae, the gigantic clouds of stellar dust and gas that the Hubble Space Telescope is examining. The cross features slices of a Mexican meteorite that NASA astronauts used while training to handle moon rocks. Fast forward to today. Now I see the Moon in a far different light — not as a destination but more a point of departure, one that places humankind on a trajectory to homestead Mars and become a two-planet species. It is time to lay the groundwork for effective global human exploration of space. Read all about Buzz Aldrin, the space race, and the quest to reach Mars in Star Struck: Seeing the Creator in the Wonders of Our Cosmos, written by yours truly and astronomer David Bradstreet (Zondervan, Sept. 2016).